The 2016 NASCAR Sprint Cup Series (NSCS) teams were up early Saturday morning for their second Food City 500 practice session at Bristol Motor Speedway (BMS), and with a lap speed of 126.370 MPH, it was Kyle Busch showing the fastest way around the track. Series Rookie of the Year (ROTY) candidate, Chase Elliott, was second fastest in the session with a lap speed of 126.253 MPH, and he was followed by Kurt Busch (126.137 MPH) who was third, Aric Almirola (125.988) fourth and Sunday’s pole-sitter Carl Edwards (125.972) was fifth. Rounding out the top-10 fastest drivers in the session were Joey Logano (with the identical lap speed as Edwards – 125.972 MPH) who was sixth, Casey Mears (125.881) seventh, Matt Kenseth (125.732) eighth, Kasey Kahne (125.617) ninth and Ryan Newman (125.592) posting the 10th-fastest lap speed. “Happy Hour” (final) practice for the teams is schedule from 11:00 a.m. – 11:55 a.m (ET) later this morning on FOX Sports 1. The 56th annual Food City 500 is scheduled to get started around 1:20 p.m. (ET) Sunday afternoon on FOX. Kyle Busch, with a lap speed of 177.327 MPH, was the fastest Friday afternoon during the first 2016 NASCAR XFINITY Series (NXS) practice session for Saturday’s TreatMyClot.com 300 at Auto Club Speedway (ACS). Second fastest in the session with a lap speed of 174.982 MPH was series Rookie of the Year (ROTY) candidate, Erik Jones, and he was followed by Kyle Larson (174.910 MPH) who was third, Elliott Sadler (174.795 MPH) fourth and Austin Dillon (174.681) was fifth. Rounding out the top-10 fastest drivers in the session were Ryan Blaney (174.588 MPH) who was sixth-fastest, Daniel Suarez (174.355) was seventh, Ryan Reed (174.279) eighth, Ty Dillon (174.233) ninth and Justin Allgaier (174.149) posting the 10th-fastest lap speed. Later today the teams return to the track for their “Happy Hour” (final) practice from 5:30 p.m. – 6:25 p.m. (ET) on FOX Sports 1, and then return on Saturday at 12:15 p.m. (ET) on FOX Sports 1 for qualifying. Tony Stewart currently holds the series qualifying track record at ACS with a lap speed of 185.941 MPH – which he set on Feb. 26, 2005. The 18th annual TreatMyClot,com 300 is slated to get underway around 4:20 p.m. (ET) Saturday afternoon on FOX Sports 1. 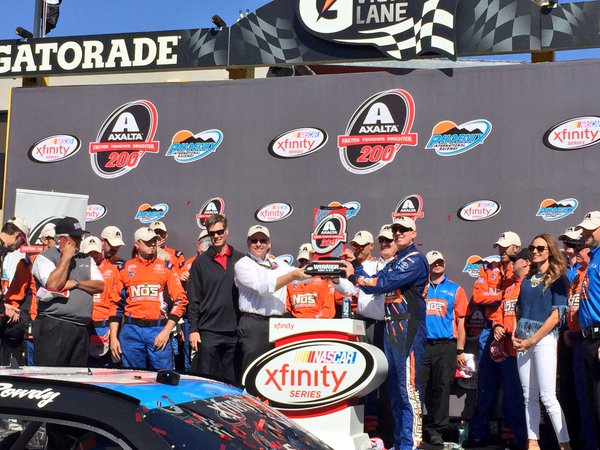 It was another visit to victory lane for Kyle Busch in the NASCAR XFINITY Series (NXS), as Busch wins – for the third consecutive weekend – the 2016 NXS Axalta Faster. Tougher. Brighter 200 Saturday afternoon at Phoenix International Raceway. Busch, who led the most laps – 175 out of 200, received his third series win and third top-10 finish of the season, his 79th series career win in 314 races and his ninth series win in 20 races at Phoenix International Raceway. 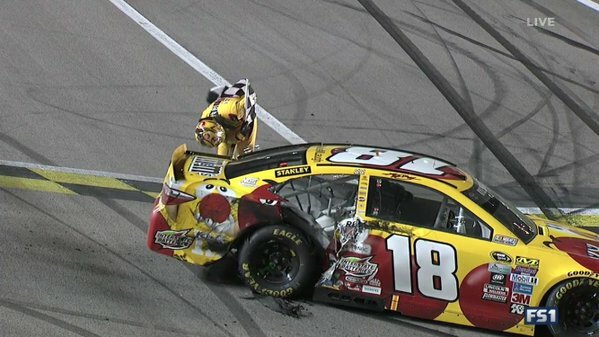 Following Busch to the drop of the checkered flag were his fellow Joe Gibbs Racing (JGR) teammates. Erik Jones (pole-sitter & series Rookie of the Year contender) and Daniel Suarez finishing second and third respectively. Rounding out the top-10 finishing positions were Justin Allgaier claiming fourth, Chase Elliott sixth, Ty Dillon seventh, Elliott Sadler eighth, Brad Keselowski ninth and ROTY contender Brennan Poole bringing home 10th-place. With his third-place finish, Daniel Suarez leaves Phoenix with an 8-point lead over Elliott Sadler (2nd) and a 9-point lead over Ty Dillon (3rd). Notes: No. 20 of Erik Jones fails inspection at Phoenix. According to NASCAR officials, the No. 20 car was found to have rear alignment measurement issues in the post-race laser inspection. Time of Race: 1 Hrs, 45 Mins, 11 Secs. Up Next: The Auto Club Speedway (ACS) NXS 300 on Saturday, March 19th, with an approximate starting time of 4:20 p.m. (ET), and television coverage provided by FOX Sports 1. 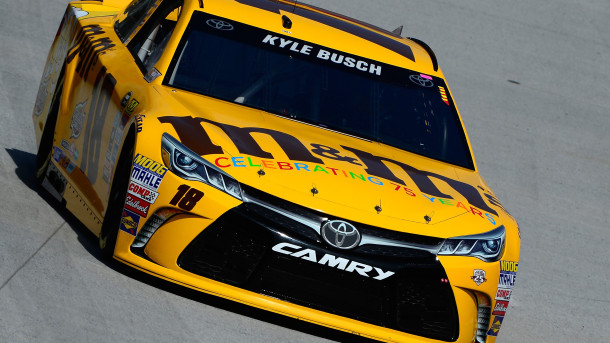 Joe Gibbs Racing (JGR) took the top-3 starting positions for Sunday’s 2016 NASCAR Sprint Cup Series (NSCS) Good Sam 500(k) at Phoenix International Raceway, with Kyle Busch and a qualifying lap speed of 138.387 MPH, capturing the top spot on Friday. This was Busch’s first series pole and second top-10 start of the season, his 18th series career pole in 394 races and his third series pole in 22 races at Phoenix International Raceway. Busch’s teammates, Carl Edwards (137.515 MPH) and Denny Hamlin (137.426 MPH) will start second and third respectively, while older brother Kurt Busch (137.394) starts fourth, and Jimmie Johnson (137.174 – wrecked during the third round of qualifying, and he will go to a back-up car for Sunday’s race, and start at the rear of the field.) qualified in fifth. Posting the identical lap speed (137.174 MPH) as Jimmie Johnson and starting from sixth is Matt Kenseth, and they’ll be followed by Kyle Larson (137.033) starting seventh, Martin Truex Jr. (136.934) eighth, Joey Logano (136.773) ninth and Ricky Stenhouse Jr. (136.752) rounds out the top-10. Once again, and for the third consecutive weekend, only 39 drivers attempted to fill the 40-car field; therefore, there was no one failing to make the starting lineup. On Saturday, the teams return to the track for two more practices sessions beginning with a morning session from 10:30 a.m. – 11:25 a.m. ET on FOX Sports 1, and then their “Happy Hour” (final) practice from 1:00 p.m. – 1:50 p.m. ET on FOX Sports 1. The 12th annual Good Sam 500(k) is scheduled to get underway around 3:50 p.m. (ET) Sunday afternoon, and FOX will provide television coverage of the event. 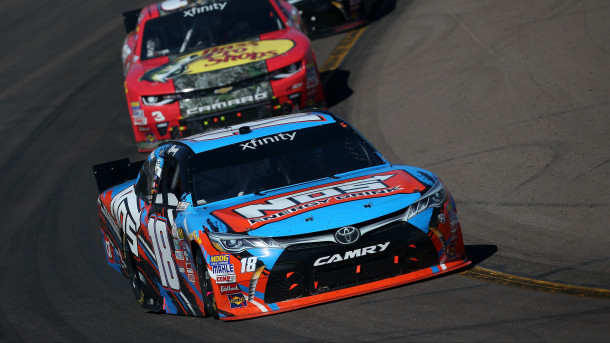 Kyle Busch continued his momentum from last weekend’s pole to victory in the 2016 NASCAR XFINITY Series (NXS), as he repeated the achievement in dominating Saturday’s Boyd Gaming 300 at Las Vegas Motor Speedway (LVMS). 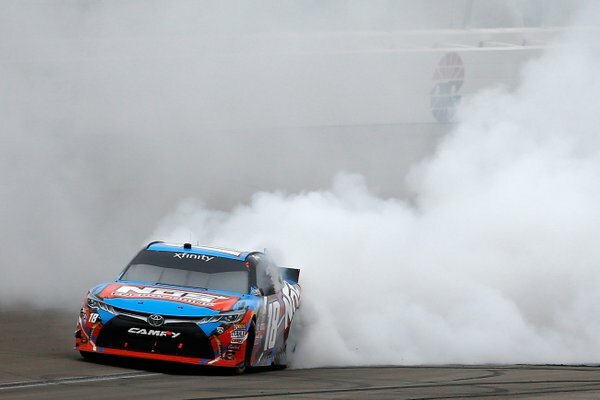 Busch, who led 199 laps out 200, received his second series victory and second top-10 finish of the season, his 78th series career victory in 313 races and his first series victory in 12 races at LVMS. Busch was followed to the drop of the checkered flag by fellow Joe Gibbs Racing teammates, Daniel Saurez and series Rookie of the Year (ROTY) candidate, Erik Jones finishing second (0.817 seconds behind) and third respectively. Rounding out the top-10 finishing positions were Chase Elliott finishing fourth, Austin Dillon fifth, ROTY candidate Brandon Jones sixth, Ty Dillon seventh, Elliott Sadler eighth, Justin Allgaier ninth and Brendan Gaughan finished 10th. With his second-place finish, Daniel Suarez takes the lead in the point standings and leaves Vegas with a 3-point lead over Elliott Sadler. Time of Race: 02 Hrs, 03 Mins, 47 Secs. Up Next: The Axalta Faster. Tougher. Brighter 200 at Phoenix International Raceway on Saturday, March 12th, with an approximate starting time of 2:50 p.m. ET on FOX. 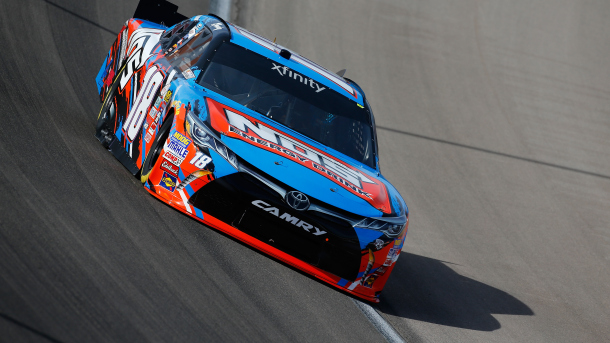 For the second consecutive NASCAR XFINITY Series (NXS) race weekend, Kyle Busch captured the pole (his 50th in the series) when he ran a qualifying lap speed of 182.698 MPH, and will lead the field in the start of this afternoon’s 2016 NXS Boyd Gaming 300 at Las Vegas Motor Speedway (LVMS). This was Busch’s second series pole and second top-10 start of the season, his 50th series record career pole in 313 races and his series pole in race at LVMS. 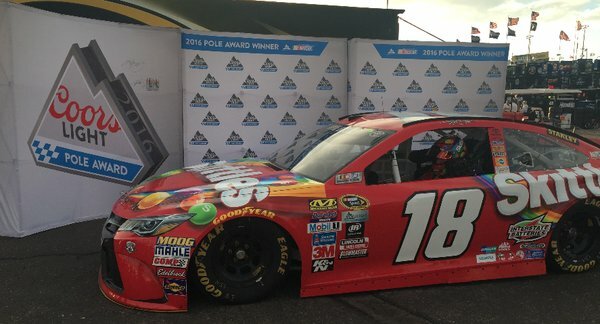 Series Rookie of the Year (ROTY) candidate, Erik Jones, will start second on the outside pole with a qualifying lap speed of 182.642 MPH, and he’ll be followed by Daniel Suarez (182.519 MPH – giving Joe Gibbs Racing the top-3 starting positions, as they did last weekend) starting third, Chase Elliott (181.702) fourth and ROTY candidate Brandon Jones (181.684) starts fifth. Rounding out the top-10 starting positions will be Justin Allgaier (181.439 MPH) starting sixth, Elliott Sadler (181.378) seventh, Brendan Gaughan (181.238) eighth, Ty Dillon (180.415) ninth and Aric Almirola (180.144) qualified in 10th. The 20th annual Boyd Gaming 300 is set to get started around 4:20 p.m. (ET) this afternoon, and FOX Sports 1 will provide television coverage of the event.